Looking up the etymology of the Devil's nickname, Old Nick, I came across this article in OUPblog written by Anatoly Liberman. For some reason, devils, at least in English, are often called old: Old Bogey, Old Scratch, Old Nick, and even Old Nick Bogey. [...] But who was Nick? This question has bothered numerous researchers. The expression an old man/woman usually carries a negative connotation, someone who is harmless, and perhaps frail; a figure either to be pitied or deserving of our respect. On the other hand, old when positioned in front of kinship terms or first names has positive connotations. Imagine the greeting between two close friends; e.g. "Hello old man!" and "How's me old mate?" When we mention our elderly relatives, "Dear old Auntie May", and when someone is reliable and trustworthy we say, "Good ol' Barney, you can always count on him." Curiously, pictorial representations of God in the Occident from the 15th century onwards, depict Him as looking almost elderly. 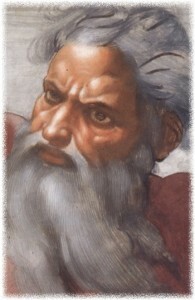 The social imaginary of the Christian deity is a bearded man with a lined face and flowing white hair (Michelangelo's Sistine Chapel) — the stereotypical traits of an old man. Although God is advanced in years, He also appears to be vigorous, intimidating and solemn-looking; would we dare call Him old? In this case, was the term old considered too derogatory and disrespectful, six or five hundred years ago? Whereas if one Googles images of Satan, the devil, Lucifer, etc. one will see time and time again a youthful, strong, malevolent and powerful-looking figure, very different from the adjective "old". As far as I'm aware, the adjective old is never used in Italian to describe the devil in person, instead Italians will often call him: il male /MA-le/ (evil/wickedness), la bestia (the beast), L'Anticristo (the Antichrist), Principe delle Tenebre (Prince of Darkness), and Satana (Satan). All of these expressions sound grotesque, frightening, and fearful. Now I am well aware that equivalent English expressions exist but there are no Italian equivalents for these English nicknames: Old Nick, Old Scratch, Old Ned, Old Roger, Old Horny, Old Harry, Old Billy, old boy (US term, according to the OED), which sound terribly innocuous, endearing and affectionate to my ears. Why did the English and Americans freely adopt "old" to describe Satan and not God? Were the nicknames Old Nick, Old Bogey, Old Scratch etc. meant to be jocular, fearful or derogatory in nature? Did the word old have different connotations before the 19th century? And finally, when was the adjective old first used as a nickname for the devil? Well might the Text call it listening to the Council of the young Heads ; that it was indeed with a Vengeance ! but those young Heads too were acted by an old Devil, who for his Craft is called, as I have observ'd, the Old Serpent. And the great dragon, that old serpent called the deuyl and Satan was cast out, which deceaueth all the world. and he was cast into the earth, and his Angels were cast out with him. Scholar.—In the serpent's head lieth all his venom, and the whole pith of his life and force. Therefore do I take the serpent's head to betoken the whole power and kingdom, or more truly the tyranny, of the old serpent the devil. The Seed (as Saint Paul doth plainly teach) is Jesus Christ, the Son of God, very God and very man : conceived of the holy Ghost : engendered of the womb and substance of Mary, the blessed pure and undefiled maid : and was so born and fostered by her as other babes be, saving that he was most far from all infection of sin. Master.—All these foundations that thou hast laid are most true. Now therefore let us go forward to those his doings, wherein lieth our salvation and conquest against that old serpent. And as Christ saith of miraculous Faith, that by the vertue of it, they shall take up Serpents and if they drinke deadly poison, it shall not hurt them : So is it true of iustifying Faith, that whosoeuer beleeues, shall wrastle with Sathan the old Serpent, and be safe, and the drink of the deadly poison, which his sinnes gaue him in the time of ignorance and impenitencie, shall not hurt him : This was prefigured in the brasen Serpent, which as it deliuered the people from the biting and stinging of fiery Serpents ; so our Sauiour lift vp vpon the Crosse, saues all them that looke vp to him with the eyes of Faith, from all the fiery and poisoned darts of the Diuell, whether darts of temptations here or of damnation hereafter. Wee here learne how naturall and proper it is for wicked men, to mock, abuse, and persecute Gods children : For they being Serpents, euen the spirituall generation of the old serpent Sathan, therefore by the sentence of God himselfe, they are at an euerlasting odds & enmity with Gods people. And as Moses lifted up the serpent in the wildernesse, that they who were bitten of the fiery serpents by looking on the brasen Serpent, which was a figure of Christ, should be healed : even so the Sonne of man was to be lifted up upon the Crosse, that whosoever being stung by the old serpent the Devill, looketh upon him with the eie of a true faith, that is beleeueth in him, should not perish, but have eternall life, which truth is acknowledged by the Master of the sentences : [Latin quotations omitted]. And as no salve or medicine could heale the bodies of those that were bitten: so can no worke of man cure the biting of that old Serpent or sting of sinne, but the venom thereof rageth and reigneth, tormenting the conscience unto death. Many instances of "the old Serpent" as a nickname for the Devil appear in later 17th-century writings. But that which sticks i'th' stomack of our Don,/ Like a good Meale (if ever he get one)/ Was the redeemed Slaves ingratitude,/ Whom he enlarg'd and gave full latitude/ Of Leg and Arme, which they uncivill Devils/ Employ against the Rescuer from their evils./ Whom thinke you in this Fact was Paramount,/ But that unlucky Rogue Gines Passamont ? Whom though the Gallies misse, yet for this trick/ Ile warrant him a Passe-port to old Nick. For Round-heads Old Nick stand up now. OLD NICK, the devil. The following ludicrous reason is given for this appellation, and that of old scratch : the angel first employed in forming women, had forgot to cut their parts of generation, which the devil undertook to do by the following contrivance, he placed himself in a kind of sawpit, with a scythe fixed to a stick, in his hand, and directed the women to straddle over it ; the pit being too deep for the length of his instrument, he gave the tall women only a moderate scratch, but the little women by the shortness of their legs coming more within his reach, he maliciously gave them monstrous gashes, or nicks, whence he was called old scratch, and old nick. That same source identifies the terms "Old Harry," "Old One," and "Old Roger" as additional then-current nicknames for the Devil. You have a thousand Jack Catches now attending you without with Halters and Hatchets to make an end of her [Jack's grandmother's black cat], when your Honour pleases to direct her Execution ; or else you have a fiery Dragon gaping for her, if you give but once the Signal for her Death : This Box, great Sir, bears you the absolute Power over her, over us, over Old Scratch or Nicholas the Antient. You see, Madam, says she [Mrs. Jewkes], I carry the Marks of your Passion about me ; but I have received Order from my Master to be civil to you, and I must obey him : For he is the best Man in the World, notwithstanding your Treatment of him. My treatment of him; Madam, says I ? Yes, says she, your Insensibility to the Honour he intends you, of making you his Mistress. I would have you to know, Madam, that I would not be Mistress to the greatest King, no nor Lord in the Universe. I value my Vartue more than I do any thing my Master can give me ; and so we talked about my Vartue ; and I was afraid at first, she had heard something about the Bantling, but I find she hath not ; tho' she is as jealous, and suspicious, as old Scratch. OLD. Crafty; cunning. Used in vulgar language.—Webster . When a person attempts to get the advantage of another, and is frustrated in the attempt by the sagacity or shrewdness of the other, the latter will say, 'I'm a little too old for you,' meaning that he is too cunning to be deceived by him. This sense of old may or may not have come from the longstanding association of old with the Devil; a more neutral reading of the phrase "I'm a little too old for you" is that it means "I'm not as naïve as you think." To sum up, the association of the Devil with old may in the first instance be connected to the biblical reference to "that old serpent called the devil and Satan," and subsequently (and more generally) to the Devil's ancientness and cunning. "OldNick," the devil. Hotten says from the Scandinavian knickar, the destroying principle. Butler says in Hudibras: "Nick Macheivel had ne'er a trick. Though he gave name to our "Old Nick." Probably the one explanation is as nearly correct as the other. -The American slang dictionary, by James Maitland. 'Old' in the context of the devil refers to the familiarity of his interference; 'nick of time' refers to escaping his domain (by the grace of height) and is referenced in the explanation for the 'nick' or 'scratch' etymology noted on @Sven Yargs, and in our contemporary use of 'nick of time' or "or at the critical moment"
As @Dingo_Dan pointed out, I strongly suspect that this is "old" in the somewhat dated slang sense of "well known", especially given that "Old Nick" seems likely to have originated as a way to avoid referring to the devil by name. "Old Nick" would help distinguish this from any other "Nick" you might know. I don't think referring to depictions of the devil, and pointing out that they resemble young, not old, men, is helpful here. Someone will blast me for guessing, but while waiting for an authoritative answer, my guess is that "old" here refers to the devil having been around for a long time (certainly longer than Man, for instance). It emphasizes that this character is nothing new, but has been plaguing Man from the (his) beginning. The oldest widely accessible text describing the devil as old is Revelation 12:9 "And the great dragon was cast out, that old serpent, called the Devil, and Satan, which deceiveth the whole world: he was cast out into the earth, and his angels were cast out with him." Martin Luther's hymn A Mighty Fortress Is Our God" includes the lines: "And still our ancient foe, doth seek to work us woe. His craft and power are great, And armed with cruel hate, On earth is not his equal. "(emphasis mine) The English translation uses ancient foe in the place of old serpent. This biblical tradition harks back to the Genesis account of the serpent in the Garden of Eden. These usages do not convey an idea that the entity described is aged or old in appearance, rather that he has been around a long time, that he dates from antiquity. @ Sven Yargs has documented a rich history of references in an earlier post, and I agree with @ Drew in saying that the fact that the devil has been around a long time is the sense in which he is ever said to be old or of old. You ask whether the use of "old" is intended to be jocular, familiar, derogatory, fearful, or affectionate - I suspect it is supposed to be all of them. When I saw the question, I was reminded of the ways of referring to the fair folk (kindly ones, good neighbors, little folk, fair folk) - which was naming them not based on their natures, but on their reactions. The fair folk of mythology were not particularly good neighbors, but were kindly named in an effort to avoid drawing their attention, to not offend them (if they did notice), and probably also to subtly diminish their status with a kind of forced jocularity, since the people naming them didn't actually favor them or want them around. So, for your old devil, I thought the reasons for such contradictory meanings might be much the same. Familiar and jocular (and even mildly affectionate) intonations, might be meant to appease or diminish the fear of, or power of, the devil. The diminutive and even derogatory intonations might get invoked to deny or diminish the devil's influence. A very multifaceted result from such a word choice, which is probably part of why it was so popular. The basic principles of this intention would be, that names call attention (so be friendly and not draw their ire); that names give power (so use nicknames, references, and indirect ways of talking about); that fear gives power (so give a name familiar and jocular to reduce fear); and that respect gives power (so derogatory and diminutive will deny that power to an unfriendly entity) - so cutesy nicknames are useful for talking about powerful and unfriendly entities, without naming them, when you don't want to respect, but also don't want to offend. "Old" can and is used for a lot of those purposes, more or less simultaneously, so it would make sense as a popular descriptor if the speakers were using some of these principles. That would also be why the descriptor "old" would be used for the devil and not god - I suspect it would be because people wanted to invoke god in respect and power, rather than diminish that power through familiarity and jocularity. God's age is not relevant, since the devil is named "old" for many reasons that don't have to map onto literal age. Several other answers have dealt with historical usage quite thoroughly, so I'll leave this answer at that. “Old man” in both OED sense 3. colloq. and sense 2. Theol. might be relevant here. Regarding sense 3. colloq., I already knew the phrase as slang for the captain of a ship, or for a military commander. The OED’s first example of the ship-captain sense dates back only to 1821, but examples from 1840 (Dana) & 1865 both suggest it was old established among sailors. The military sense seems only to date from 1830 per OED, though some of the nineteenth-century examples likewise suggest greater antiquity in oral use. Usage of the term for a “master, overseer, or foreman” has examples back to 1668 (Dryden). These usages smack of wary disrespect for a person in authority, which the devil is per Ephesians 2.2 & Luke 4.6. OED definition for sense 2. Theol. (said to derive from Paul’s Epistle to the Romans, as an alternative to “Old Adam”) begins “Mankind (or a person) representative of unregenerate human nature; the primitive or violent aspects of a person's character”; examples start with Ælfric. Not the answer you're looking for? Browse other questions tagged etymology american-english british-english or ask your own question.